Earlier this year the Cirka team were asked to refresh Dulux’s Let’s Colour Guarantee, creating a brand for the new name of the promotion, the ‘Perfect Colour Promise’. The concept is a promise from Dulux to replace any tin of paint if you don’t get the colour right the first time. If you change your mind, you can simply get another colour for free. The Dulux brand team had already explored a range of creative start points and we were tasked with taking the initial sketch ideas into a functioning sub-brand that would be flexible across all the various POS formats. 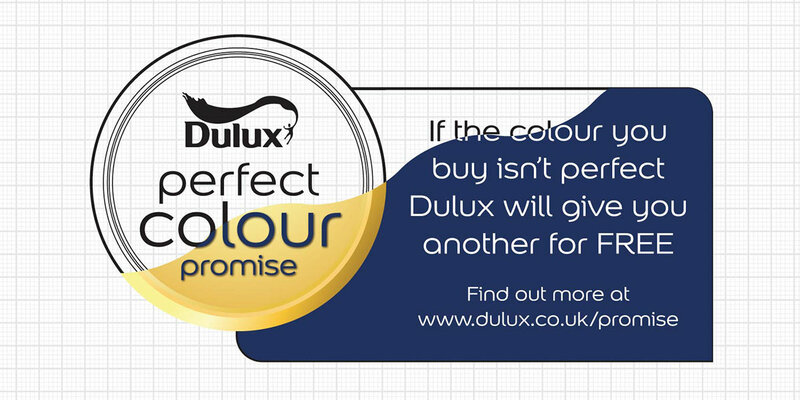 The Perfect Colour Promise was rolled out in Summer 2016 as part of the “Dulux Endurance campaign” and is currently used across the majority of Akzo Nobel’s marketing and POS materials. You can read the full case study for this project here.